Say what you will about Warsi (for there is much to say) but at least you’ve got a pretty good idea of what she’s going to do and this usually involves cutting the most aggressive of stances before completely overplaying her hand and somehow trapping herself in a self-inflicted headlock (I’m not entirely sure how you perform a headlock on yourself but if anyone were able to perform such a physics defying feat it would be Warsi). In a standard outing, this tends to involve a trademarked rendition of her ‘pulled up by the bootstraps’ autobiography and a frantic assault on anyone who happens to be in the immediate vicinity followed by a complete mangling of the facts and a hasty retreat in the face of an audience who’ve suddenly turned hostile. Now, in the context of this week’s news, this seemed like an invitation to tragedy as the message emanating from the Tory party conference (aside from entirely avoidable blunders) has been largely one of ‘Keep Calm and Carry On’, but Warsi doesn’t really do ‘calm’ and in the pre-arranged version of events that I had in my head I could see her outdoing Theresa May on the gaffe front, possibly by claiming that the courts allow immigrants to stay if they have a Tesco Club Card. Heckles would follow, Warsi would carry on digging and by the end of it, I’d be sitting pretty and rather pleased with my new-found powers of precognition. Ok, so I wasn’t a million miles from the truth on this one but still, it was more muted than my pre-show machinations would have led me to believe. For example, she did start pretty aggressively on the Catgate question and went through her usual Immi-Crims motions before retreating under a hail of boos following an ill-timed Blame Labour play, but she wasn’t quite as frothy as she has been in the past. Granted, she did managed to get herself entangled in a trap of her own design when she strenuously tried to blag her way out of the Fat Tax question (which went something like this: Tax isn’t the solution > Got to change behaviour > Don’t know if we can do that > I had a burger once! > Big up Dewsbury Market! > Two full bags of shopping! > Costs less than a burger! > ??????) but I’ve seen her flail about in far more entertaining ways and I felt a little cheated when she wasn’t chased out of the studio by pitchfork wielding audience members. In short, the version in my head was way more fun. I must confess that I didn’t have the clearest idea of what Burnham was going to get up to tonight as I find him to be a very difficult man to pin down. On the one hand he’s a slick operator who’s good on telly, can summon up some semi-convincing righteous indignation and generally has a knack for not putting his foot in it. However, there is also something about him that I find a little unsettling in that I have real problems in figuring out his intentions. Some of this is down to the fact that he’s quite deft at seguing between bosses without breaking much of a sweat but I think the real problem is that Burnham’s got his foot in quite a few ideological camps (in that he can sound very Old Labour on some issues while also being incredibly New Labour on others) and that makes it very hard to ascertain exactly what it is he believes in. Consequently, I reckoned that we were on for a polished display, but one that left you not quite fully satisfied that you had actually seen the real Andy Burnham. How hard can it be to figure out what Charles Kennedy is going to do? After all, he’s been about for ages and during that time he’s taken on (in my head at least) all the virtues of a kindly uncle who your mother doesn’t entirely trust but you adore, largely on account of all the sly tenners he slips you with a knowing wink. Given the above, I was pretty sure that this would be a by-the-numbers exercise in Kennedyism: An overt display of believable humanity (nothing makes you appear more human than the knowledge of a life coloured by vice) that would probably feel akin to being tucked into bed with a glass of warm milk (that may or may not contain a thimble’s worth of whisky). Job’s a good ‘un right? Well, the job’s partially a good ‘un in that everything was delivered in that gentle way that makes his voice seem like auditory Calpol but what I wasn’t prepared for was just how mutinous Kennedy has become. Sure, he’s been muttering about how he’s really not taken with the coalition for some time now but watching him last night was like rewinding the clock by a good two years. The Tory stance on the Human Rights Act? “Nonsense”. Who’s right on the economy? “Ed Balls”. Who would he have preferred to go in coalition with? “Labour”. Sedition I say! So yes, that caught me slightly unawares but I also found it to be quite comforting as it took me back to a time when there were certain constants in politics and just keeping up with the news wasn’t the nausea inducing white-knuckle ride that it’s become of late. So Mr Kennedy, continue to be a “dispassionate voice from the backbenches” because I rather like it. And keep slipping me those tenners. I like that as well. I hate Billy Bragg. I hate him in many ways but mainly because people assume that I should love him. I’m a bit of a lefty, right? I play guitar, right? So I should love Billy Bragg, right? Wrong, wrong, wrong! 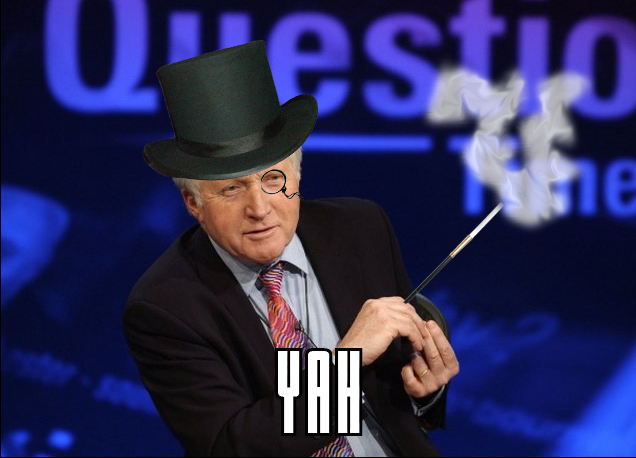 No, I have problems with Bragg, some of which are philosophical, others of which are more visceral. On the political/philosophical front I just find him to be like some sort of ideological Maginot Line that Thatcherism’s panzers’ outflanked 30 years ago. Since then they’ve been living it up in Paris while Bragg continues to grimly face east, pouring fire into an empty field that the enemy has long since vacated, seemingly unaware the Third Republic is now but a footnote in history. In a way I should admire such stubbornness but the futility of it all renders that impossible. The miners’ strike is over Billy and no amount of Woody Guthrie covers will ever bring it back. So there’s that but I suspect the biggest problem is that there’s something about the man himself I can’t abide and that’s his mirthlessness. Now I know he’s highly devoted to his cause and feels a certain weight of responsibility upon his shoulders but for Christ sake man, lighten up now and then, ok? 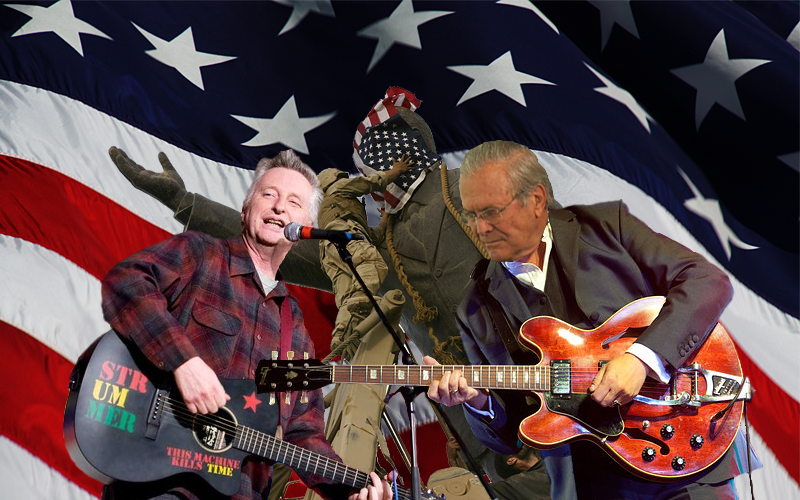 So yes, that’s how I was approaching Mr Bragg’s appearance and in my head I had it all figured out (to the point where I’d put together a photoshop of him duetting with Donald Rumsfeld in the hope it may annoy him. See Fig. 1). However…. He really wasn’t bad. His arguments were pretty well-reasoned, there was even the odd attempt at humour and the crowd genuinely seemed to like him (as well as the bizarre spectacle of Warsi claiming that she had a “huge amount of time for [his] campaigns’”. Pull the other one, m’lady). So there we go, Eggs Benedict all over my face. However, instead of taking back all my spiteful words I am instead going to chalk this up as an aberration as to do otherwise would be to imply that I am somehow wrong. And that’s just plain old not going to happen. She wasn’t that bad either! Ok, so her grasp on economics isn’t exactly the firmest (Quantitative Easing is something to do with a “computer button” dontchaknow?) and of course there was the familiar mashing of the terms of ‘immigrant’ and ‘criminal’ into a stick to beat people with but it was quite restrained by her standards and I don’t think I was ever driven to physically shout at the telly as I usually do when she’s on. This is not to say that I’m the newest member of the Jane Moore Fan Club but as potential train wrecks go, it could have been much, much worse. That they would be… crowdy? Yes, they were crowdy so hooray for me. Apart from that, they weren’t the most electrifying bunch but I’m inclined to forgive them this as it’s been such a weird conference season that it’s hard to know what to think about politics at the moment. Still, a mention is deserved for the lady who described herself to be a “scarlet woman” whilst looking about as scarlety womany as Anne Widdecombe and also for the girl who suggested that the government should get the hell out of lives and not impose fat taxes whilst simultaneously demanding that the nation be subjected to a “compulsory exercise regime”. That’s an… interesting…. position you’ve got right there. Everybody gets 5. Except Kennedy who gets 6 on account of my fondness for him and Moore who gets a 4 on account of my lack of fondness for her. So there we have it: An odd and less than thrilling show that never managed to live up the expectations I had created for it. Still, at least I won’t have that problem next week as it’s pretty hard to engineer a mental scenario that only contains Andrew Lansley (who at this point is the only confirmed panelist). I suppose I could have him in solitary confinement. Actually, that’s not a bad idea… At least the NHS would thank me.